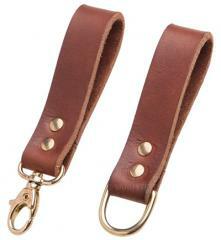 Old timey leather belt hangers for whatever little gear you need to carry on your belt. Finnish made from quality vegetable tanned leather, there's lots of love in these! 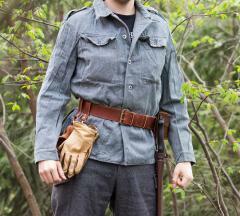 An excellent choice for gentleman adventurers, or any traditional outdoorsman still stuck in the 19th century. 50 mm wide, fits pretty much any belt. These are a perfect match for our Särmä leather belt! 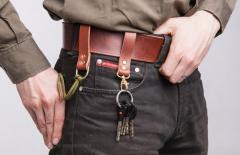 The D-ring model is great for attaching any lanyards, clips etc. Also works as an "adapter" for shoulder harnesses! With a little imagination you can attach pretty much anything to a D-ring, see the photos for tips! The carabiner hanger is quick to use, good for holding your keys, work gloves, kuksa cup or any other little piece of kit with a suitable attachment point. These are made for us by Helsingin Olkain, one of the last Finnish belt and brace makers who still produce stuff domestically. Made with love and pride right here in Finland!